Introducing the RiscPiC – a new ‘RISC OS-flavoured’ case for the Raspberry Pi. 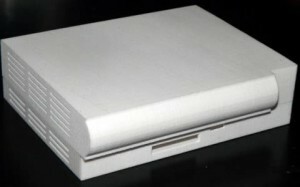 RiscPiC is a new range of cases for the Raspberry Pi which has been designed with RISC OS and its users in mind – and as a tribute to the most powerful computer Acorn released, the iconic RiscPC, which celebrated its 20th birthday in 2014. 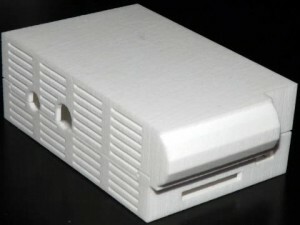 The standard RiscPiC is designed so that most of the connections found on the left and right sides of the Raspberry Pi are brought out to the rear of the case – just as they are in ‘normal’ computers. This is done by making the case wide enough that suitable adaptors can be attached to the Raspberry Pi to direct the connections towards the rear, with those adaptors – like the Pi itself – being inside the case. Two adaptors will be supplied with the case, one for the headphone socket, and one for the HDMI output. The power supply and SD card sockets remain accessible from the front, the USB and ethernet sockets remain accessible from the rear, and the case measures approximately 12cm x 10cm x 3cm. The RiscPiC-mini combines the look of the RiscPiC with the size of the more customary case designs for the Raspberry Pi, with all the connections directly accessible on the side on which they are found. This case measures approximately 6cm x 10cm x 3cm. Both the RiscPiC and RiscPiC-mini should be available to buy in limited numbers from Soft Rock Software at the London Show, on 25th October, 2014, and at RISC OS shows in mainland UK after that. Final pricing has yet to be confirmed, but it’s expected that the standard RiscPiC case will be priced at no more than £50 including VAT and the RiscPiC-mini no more than £30 including VAT.